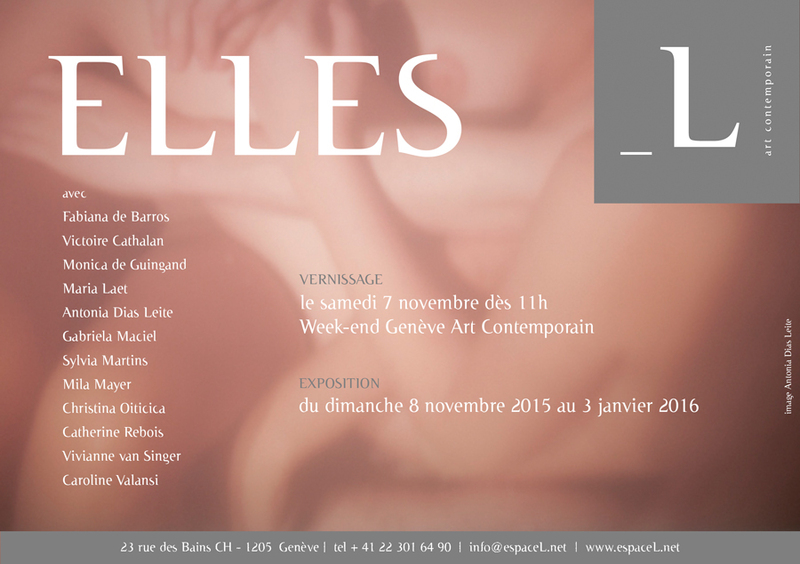 "Elles" presents the work of 12 women artists, with inspiration and influences generated from various places. This exhibition demonstrates how the individuality and identity of each of these artists are developed distinctly, based on different principles. The exhibition offers an oportunity for the public to create connexions between the art works and to break stereotypes regarding féminine art. The triptych photographic title « Interior Movement No 4-6 », from Antonia Dias Leite suggests something that happens on the Inside, however it is the female bodies, naked, which are overlapped creating an almost abstract image by a color palette restricted to a skin color pink. Caroline Valansi covers the edges of old frames similar to those found in our homes, with soils of various colorations collected in trips, and fills with pyrite the space where the picture would be found. This material, in contrast with the earth, reflects the surrounding light, creating a "magical" relationship with a past that cannot be left behind. Christina Oiticica’s work, on the other hand, uses the nature’s action on her work. She buryies her canvas in different places in the world, confering to them the power of the action of time. The soil then deteriorates the artwork, allowing its final state to be unpredictable. "Tree Dance in Second Life" is a video created by Fabiana de Barros through Second Life social media, where anyone can create an avatar and live a virtual life. "Tree Dance" was originally created by Gordon Matta Clark. The work of Fabiana de Barros replicates the steps of the artist, using a technology where time and space are unique. Vivianne van Singer is like an alchemist who constantly searches the natural colour in raw materials. In "Milky Way" the artist uses images of mammographys and applies to the original breasts profiles non-existent colours, bringing up new auras and meanings to them. Gabriela Maciel analyzes time through material; her work explores the memory and the void that memory inhabits. In her three and two-dimensional pieces, she selects what may or may not be seen – by either shaping objects such as cups and bottles with hardened fabric, or painting over words and images on a book’s page – creating a new story. Maria Laet plays with the opposing symbology of materiality. The solidity of the stone in "Pedra Real (Real Stone)" contrasts with the malleability of the water. The stone leaves a mark on the ground, in the place where it once was. This mark, this trail, this memory is the water coming from the ground. There is a paradox between the physical structure of both water and stone, which questions the extent of the “real”. Mila Mayer documents the everyday. The photo shows what it is - there is no preparation to compose the image. "Jet d'eau" focuses on a girl looking at the gush of water - the work depicts the moment of that happening – not creating it, simply framing it as seen. Sylvia Martins’ abstract works are based on her travels and influences of ethnic conceptions, anthropology and decorative arts. "La Vista 2" belongs to Trance series, where colours emerge from the canvas center, playing with our unconscious. Victoire Cathalan devotes herself to drawing and painting, developing a subtile univers between the human and the vegetal world, having the skin acting as its border. On the other hand, Catherine Rebois’ use strong contrasts in her black and white photographs, oposing our intellect with our instinct.